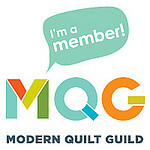 It’s that time of year again when the Ventura Modern Quilt Guild does their scrap box challenge. Those wanting to participate bring a shoebox full of scraps and then there is a blind draw to see whose box each person gets. I was the recipient of our current president, Tisha Maeda’s scraps. She has been president for the past 2 years and has played an important role in the Thomas Fire Quilt Project. Her scrap box was filled with a treasure chest of beautiful fabrics. Given the amount of work and effort Tisha put towards the Thomas Fire quilts I thought I would make her a wall hanging size of the Perkiomen quilt block that was primarily used in the Thomas Fire quilts. It was so much fun to make this 30 X 36 inch quilt and as always I like to quilt the hell out of everything. I was able to give her this quilt on Monday and her smile was evidence that she loved what I created. I really like the asymmetry that you created in the layout.